APRIL 2, 2019: OUR NEWEST ISSUE IS HERE (VOL 6, NO 1, 2019). READ FOR FREE NOW. REGISTER FOR FUTURE UPDATES AND NOTIFICATIONS. 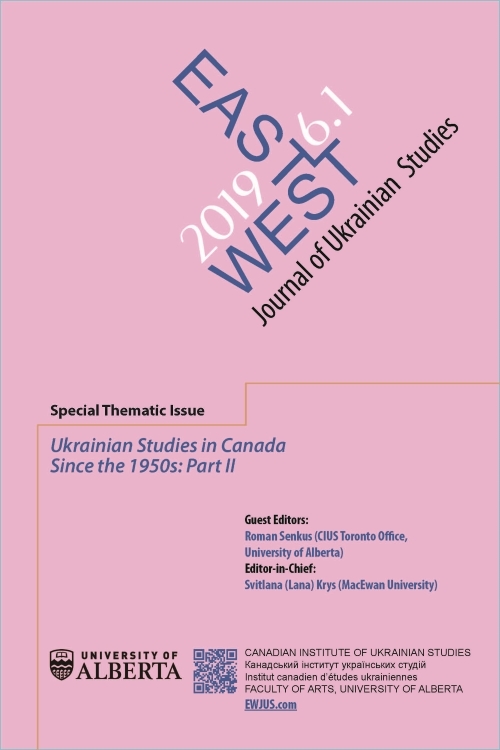 East/West: Journal of Ukrainian Studies is an open access, scholarly, peer-reviewed, online journal, based at the Canadian Institute of Ukrainian Studies, University of Alberta, under the editorship of Professor Svitlana (Lana) Krys, Kule Chair in Ukrainian Studies (MacEwan University). The aim of EW:JUS is to advance and disseminate innovative interdisciplinary research and critical debate in all aspects Ukrainian Studies by publishing original research articles, reviews and review articles. EW:JUS encourages submission by academics, graduate students, and policymakers of previously unpublished work. The journal welcomes themed issues by guest editors, original scholarship presented at conferences and is open to sponsoring online forums for scholarly debates and exchanges. The journal will accept research that incorporates web technologies and multimedia (e.g., audio, video and visual materials). Схід/Захід: Журнал українських студій запрошує українські видавництва висилати нам рецензійні примірники нових академічних видань на українську тематику. У свою чергу, ми намагаємося якнайскорше призначати книжки на рецензію і публікувати рецензії з метою розповсюдити інформацію про українські видання у англомовному світі. Примірники просимо висилати на ім’я Tані Стех. Call for Papers: Special Issue of EWJUS "Kharkiv: The City of Diversity"
Despite several recent studies on Kharkiv (by D. Chornyi, M. Dobchansky, V. Kravchenko, V. Masliychuk, O. Musiyezdov, and others), this city still remains underexplored because it is difficult to explain its historical specificity, and especially because of the manner in which the city and its inhabitants respond to present challenges. The historic fate of Kharkiv gives grounds for various questions: is Kharkiv a Ukrainian or a Russian city? Is it commercial or industrial, metropolitan or provincial, deindustrialized or postmodern?